A hammer toe is a deformity of the foot that causes toes to bend or curl in a downward fashion rather than point forward. This deformity is typically the result of a muscle imbalance between the tendons on top and the tendons on the bottom of the toe. Hammer toes can be flexible or rigid and they can affect any toe on your foot. Most cases of hammer toe are reported on the second or third toe. There are generally two types of hammertoe: flexible and rigid. If the toe can still move at the joint, and the toe still moves, it is considered a flexible hammertoe. This form of hammertoe is the beginning stages of its development and may be able to be reversed non-surgically. If left untreated, your flexible hammertoe can become rigid, meaning the toe can no longer move on its own. 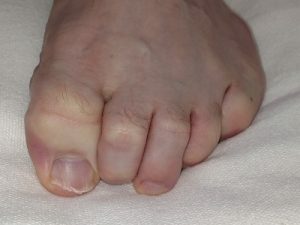 This type of “rigid” of hammertoe usually requires surgery to correct. Treating hammer toe varies depending on the severity of your condition. To treat mild hammer toe, the physicians at Foot Specialists of Cincinnati can start with conservative methods—such as padding, shoe gear selection/modification, or anti-inflammatory medications. Flexible hammer toe(s) can be alleviated by simply wearing properly fitting shoes. tendon(s) and joint(s). Most procedures are performed on an outpatient basis; they may require downtime or time away from work for recovery. For more information about the treatment of hammer toes in the greater Cincinnati area, please call our offices at 859-341-9900.